When he shot The Fire Within in the spring of 1963, Louis Malle had already established a strong reputation. Incredibly precocious, he won a Palme d’Or at the age of twenty-four, at the 1956 Cannes Film Festival, for the underwater documentary The Silent World, photographed and codirected with oceanographer Jacques Cousteau. One year later he anticipated the French New Wave with Elevator to the Gallows, scored by Miles Davis and starring a young Jeanne Moreau, who also starred in his next film, The Lovers, which won a Special Jury Prize at the Venice Film Festival in 1958 and created a scandal with its explicit eroticism. His follow-up, an audacious 1960 adaptation of Raymond Queneau’s farcical novel Zazie dans le métro, further proved his fondness for literary sources, and 1962’s Vie privée created a stir by featuring Brigitte Bardot in one of her more complex roles. Yet despite his commercial and critical success, Malle felt dissatisfied with his career thus far. Probably his apprenticeship with Robert Bresson, for whom he was assistant director on A Man Escaped (1956), had instilled in him a high exigency for the practice of his art. He was also aware of the eclecticism of his style, as well as of his themes, while newcomers like Godard and Truffaut had imposed a stronger personality. Now thirty, Malle seemed to be hiding behind literary adaptations, which looked like aesthetic variations with no real focus. The son of a wealthy family of industrialists from the north of France, Malle felt ill at ease with his bourgeois upbringing, and unlike some of the directors coming from Cahiers du cinéma (Truffaut, Rohmer, et al. ), with their right-wing inclinations, he was decidedly opposed to the war in Algeria and the Gaullist regime, even producing the overtly political first feature of his friend Alain Cavalier, Le combat dans l’île. After taking a break from fiction, shooting some documentary footage both in Algeria (for a film that never came to fruition) and back home, following the Tour de France (which became the short Vive le Tour), he began an original script, inspired by the tragic end of a journalist friend, about a man who commits suicide. The project, alternately called “Assez de champagne” and “Trente ans ce soir,” had come to a standstill when a friend handed Malle a copy of Pierre Drieu La Rochelle’s 1931 novel Le feu follet, which he had read in his youth. His shock at rediscovering it gave him the impetus to write a script adaptation in the first weeks of 1963. The film was then immediately shot in the spring, and edited in time for a September showing at Venice (where it won a Special Jury Prize) and an October release in France. The year was thus literally devoted to The Fire Within, made in a state of grace and at full speed. And this intensely personal work would help alleviate Malle’s doubts about his career. In many ways one of Malle’s most idiosyncratic films, The Fire Within reveals three layers of inspiration. The origin of the novel and the model for protagonist Alain Leroy was a real-life personality: Jacques Rigaut, an arrogant, lonely, and nihilistic dandy, close to the surrealist group in the 1920s, who exerted a strong fascination on André Breton and his friends; a ladies’ man who had affairs mostly with rich foreign women, particularly Americans; a mundane society man who hardly published (just two hundred pages’ worth of sarcastic short texts and aphorisms). Rigaut killed himself in 1929, at the age of thirty, and two years later Drieu, one of his best friends, dedicated to him the roman à clef Le feu follet. Drieu himself had been acquainted with some surrealist poets, such as Louis Aragon, but later, during the occupation, he turned Fascist, and committed suicide in 1945, after the liberation of France, when he was threatened with a trial for his German collaboration. Malle was far from Drieu politically (an episode in the film, set in a café, satirizes two members of the OAS, an extreme right-wing movement), but the two did share several preoccupations—self-doubt, love of women, nightlife. Thus Malle’s adaptation is a model of faithfulness and at the same time operates major changes. First of all, Malle decided to switch the period from the late twenties to the early sixties, bringing it closer to his own environment. He made Alain Leroy an alcoholic, and no longer an opium and heroin addict, which would have been too exotic, too dated (drugs would return to the forefront only a few years later). He also compressed the action, reducing the time of the story from forty-eight to twenty-four hours, giving it a denser atmosphere and a more tragic aura. Likewise the theme of money, which obsessed Drieu, is toned down. Finally, while the action in the book is commented upon by the narrator/author, Malle resorts to first-person voice-over only at the beginning of the film, using a few of Drieu’s sentences, so that we see the world through Alain’s eyes, allowing the audience if not an identification then at least an empathy with the protagonist. Malle makes him more sympathetic, feeling, as he later expressed, that “Drieu despises his character, and it is not possible to build an entire film on a marginal, useless, uninteresting protagonist.” At the same time, he does not soften Alain’s harsh predicament: his life is a failure, like that of his model, Jacques Rigaut, who stated, “Try if you can to be a man who travels with his suicide hanging at his button-hole.” There is something Fitzgeraldian in Alain’s disenchantment and solitude, and Malle has put on his desk a copy of Babylon Revisited, which inspired an episode in the film between Alain and a barman, absent from Drieu’s book. With such a serious central theme, the director chose a spare and austere style. At first he thought of using nonprofessional actors, as his mentor, Bresson, did. He also abandoned color after two days of shooting and decided on black and white, working with a new Tri-X Kodak film that allowed him to shoot in the streets and in real interiors with very little light. Likewise the budget was lower and the crew less numerous than on his prior films. But his major decision, of course, was to cast Maurice Ronet as Alain Leroy. Ronet, born in 1927, was five years older than Malle but looked like his alter ego. An actor for more than ten years, he had already appeared in Elevator to the Gallows and was considered one of the hopes of French cinema, as evidenced by his recent role in 1960’s Plein soleil, alongside Alain Delon, but he had never been given a true leading part. His performance in The Fire Within is his most remarkable. Accentuating the director’s osmosis with Ronet, the actor was asked to wear Malle’s own clothes; he also lost forty pounds to play Alain, his emaciated face emphasizing the exhaustion of detoxification. To enhance the realism, Malle surrounded Ronet with little-known actors (except Jeanne Moreau), including, in the role of Solange, the hostess at Alain’s final meal, Alexandra Stewart, who was to become the director’s companion. Malle and cinematographer Ghislain Cloquet’s fluid camera movements, recalling, more than Bresson, early Antonioni (Le amiche) and Preminger’s Bonjour tristesse, closely follow Ronet as he rambles through Paris, expressing Alain’s instability and the rush to his final decision. Indeed, the film’s other protagonist is Paris, as in so many features of the New Wave, from The 400 Blows to Breathless. 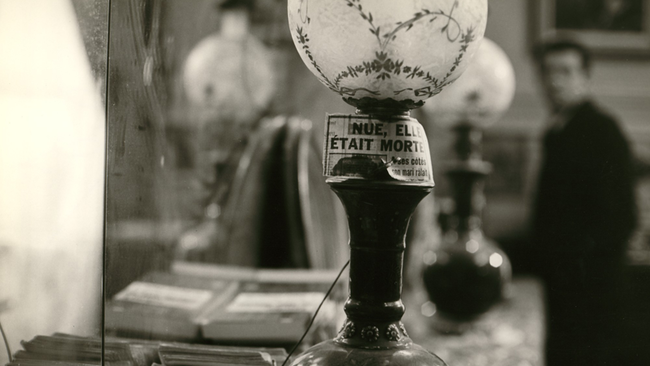 Agnès Varda’s Cléo from 5 to 7, shot a year earlier, structurally most resembles The Fire Within in its recounting of ninety minutes in the life of a woman who meets several people on her way to the hospital to get cancer test results. Malle offers a striking parallel to Varda’s film, as Alain leaves his clinic in Versailles to wander mostly through the Latin Quarter, from the Brasserie Lipp to the arcades of the Odéon Theater, from the Café de Flore to the rue du Dragon, the Luxembourg Garden, and the quai Voltaire, and ending up at place des Vosges. Meeting the challenge of confronting the City of Lights, Alain strolls through the streets, which look, under Malle’s camera eye, as sad, dull, and gloomy as his forlorn soul. In fact, Alain is saying farewell to a world of idle people—intellectuals, businessmen, parasites whose lives provoke in him rejection, disgust, and weariness. Three meals epitomize his relation to society at large. The first one, in the nursing home outside Paris where he’s staying, reveals a group of patients whose conversation is as stiff as it is pedantic. His lunch with his old friend Dubourg disappoints him, as he sees Dubourg as having traded his former nihilistic and debauched self for the tepid joys of family life and petit bourgeois happiness. At his final dinner, at the Lavauds’, place des Vosges, he is confronted with a party of sleepwalkers and puppets whose frigidity echoes the coldness of the huge interiors they live in. Alain’s postadolescent narcissism, his refusal to become an adult and to grow old, increasingly estranges him from the world and makes him less fit to adapt to others, and particularly to deal with women. Malle repeatedly said that The Fire Within was the first of his films to satisfy him totally. It’s also probably the one that worked as an exorcism and liberated him from his former persona, that of a young man living at night, having brief encounters, and blessed with an easy existence and (at least to his eyes) undeserved professional successes. At the age of thirty, and facing the same existential issues as Alain, Malle was giving an opposite answer, throwing away what he hated in himself and clearing the way for a quest of perfection and his love of life. Michel Ciment is a member of the editorial board of the French film monthly Positif and the author of some fifteen books on cinema, including Kubrick, Kazan on Kazan, Conversations with Losey, and Le dossier Rosi. He is also a critic and radio producer and the president of FIPRESCI (International Federation of Film Critics).